If you’re not already a fan of the Park West Gallery Facebook page, then you’re probably missing out on our daily Facebook poll questions. Park West Gallery asks the questions, and then our growing community of art enthusiasts, art collectors and artists weighs in with all sorts of insightful answers—we’d love your input too! 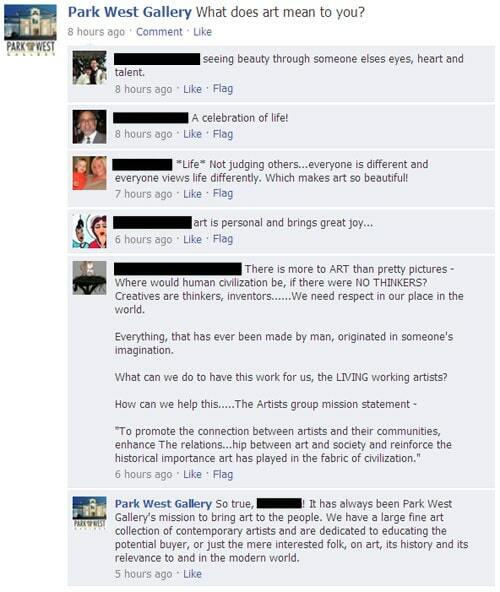 To participate in the discussion: simply log on to Facebook and click “Like” on Park West Gallery’s page. It’s that easy! Today’s Facebook poll question is: What does art mean to you? Visit Park West Gallery on Facebook to join the discussion today!